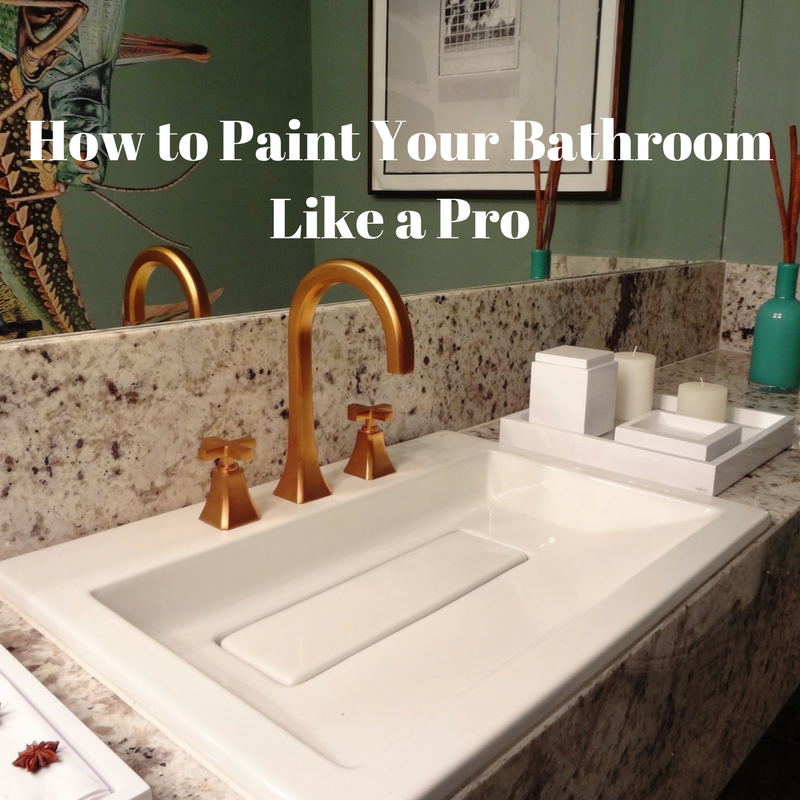 How to Paint Your Bathroom Like a Pro! A bathroom is a small, yet intimidating space to paint for most. It seems like such a quick task, but once you get started, it always is more complicated than you initially anticipated. Here are some tips and tricks (just in time for Halloween) so you can paint your bathroom like a pro! Paint your bathroom with confidence! You will want to use a semi-gloss finish of your color choice that is mold and mildew resistant. If you have a great bathroom fan to pull away moisture, you can get away with a durable, washable high-grade satin. Bathrooms endure a lot of moisture and traffic throughout the years. You want something that will prevent against any chipping, bubbling, or cracking of your paint job. Remove any handles, towel racks, and toilet roll holders prior to painting. This will ensure you get a seamless look in the bathroom. Small mistakes can really pop in a bathroom – especially with a semi-gloss finish. Another trick to give your bathroom a professional look is to remove the toilet tank for flawless application. Let’s face it, it is impossible to do a good job painting behind the tank of the toilet! Removing the tank is easy: shut off the water supply, flush the toilet, remove the tank bolts, and then pick up the tank! For small bathrooms you want to make the best of the space. Tip 1: Pick light colors to make small bathrooms feel bigger. Tip 2: Keep tiles, walls, and decorations in the same tones. Trick: STRIPES! If you want to make a small bathroom look larger, paint vertical stripes on the wall to give the illusion larger, taller room. Also, place the curtains of the shower at a higher level! Paint horizontal stripes to make the bathroom look wider. With larger bathrooms you have a little more wiggle room to personalize without compromise. Pick lighter colors to for an airy feel. Bathrooms are supposed to look crisp and clean, so do not be afraid to go for pastels or whites. Larger bathrooms are great when you want to add personality through decoration. Accent walls, decorative wall pieces, and artwork are all ways to add your personal style to your room. Trick: Try painting the ceiling of the bathroom one color and extend that same color down the wall about 14 inches to extend the feel of the bathroom. All in all, you want to choose whatever color is going to fit your personality. There is no right or wrong way to paint a bathroom. Well, there is! Just be sure to use a high quality AND semi-gloss paint to ensure you do not have any chipping, cracking, mildew, or bubbles forming in the future. Pick a fast drying, acrylic based paint over an oil based paint. If you’re in Durango or Bayfield, call me if you run into any trouble! I promise not to judge you and would love to paint your bathroom for you.